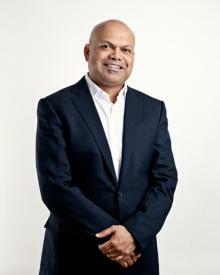 Ravi Naidoo is a scientist by training with a degree in physiology and a Masters degree in Business Administration. In the wake of the collapse of apartheid, he set about the mission to educate the world about the potential of the new South Africa and to educate South Africans by attracting the world’s leading designers in every field to celebrate and engage in design projects in South Africa. He founded Design Indaba in 1995 – an Annual International Design Conference, now incorporating Design Indaba Expo – to attract leading lights from the global design world to South Africa. He has not only imported great ideas but has brought international attention to some outstanding South African talent. He is the Founder and Managing Director of Interactive Africa, a Cape Town based company that combines logistic prowess and creative production to work on projects that promote South Africa. Since 1994 Interactive Africa, led by Ravi Naidoo, has managed a variety of high profile projects including the First African in Space Mission and the African Connection Rally, promoting telecommunications and investment in the whole of Africa. He was also the catalyst behind Woolworths and Western Cape Government of Education creating a design syllabus at the school level. Ravi Naidoo was born in 1964. He holds a Bachelor of Science (Hons) degree in Physiology from the University of Cape Town (UCT) and in 1994 he completed a Masters of Business Administration Degree at UCT, where he was nominated the Nedbank MBA Student of the Year. He has served on international design juries and panels and his work has been recognised with awards both in South Africa and throughout the world.